The Evolution into a Long Term Success Story: Beth Petrik - Meyer Tool & Mfg. When I do not know the answer to something, I ask Beth. Most people do. As Meyer Tool’s Office Manager, Beth Petrik does a little bit of everything, and can tell you how to do pretty much anything that needs to get done. Beth was initially hired 17 years ago through an employment agency to function as an AP Clerk. Although she “lacked experience,” she immediately “clicked” with Meyer Tool President, Eileen Cunningham, and was hired. Beth started at Meyer Tool as a single mom with young children. Initially, she was drawn to “the flexibility that Meyer Tool offered.” She quickly realized that beyond a willingness to work with her schedule, Meyer also emphasized family values. Almost twenty years later, Beth has found that beyond valuing family, Meyer Tool is a family in its own right. “Everyone works together,” as they endeavor to grow the company and continue to contribute to the scientific community. Beth says she has stayed at Meyer Tool not just because it is convenient for her schedule, but because she “enjoys the close knit familial atmosphere.” Beth remembers Frank J. Meyer, Meyer Tool’s founder and first president, regularly telling jokes to his staff, his concern for each member of his staff, and the support that she has had from the company as a whole. Beth does plenty of supporting on her own. She is responsible for Meyer Tool’s office management and administrative duties, accounting, event planning, and weekly payroll, something, she mentions “a lot of places do not have any more, but that Meyer has chosen to keep.” A common saying throughout the company is that “everyone wears a lot of different hats at Meyer,” but not many people wear more hats then Beth. ​Ed Bonnema, Vice President of Operations, notes another use for her enthusiasm: in part due to Beth’s energetic and friendly persona, Meyer Tool is able to keep a person, rather than a machine, in charge of the phones. “We feel this personal and immediate touch with our partners supports our family-oriented philosophy and contributes to our goal of reducing project risk.” Whenever anyone calls Meyer Tool, Beth is often the first person they speak with. Her time at Meyer Tool has enabled her to recognize voices and know where to direct a call at the drop of a name; but, it is her enthusiastic and friendly attitude that has made her a person callers look forward to speaking with. Beth notes her most memorable project as being her involvement with Science Chicago. In 2009, Meyer Tool hosted one of the stops for the Museum of Science and Industry’s Science Chicago, Life’s a Lab. Science Chicago, the world’s largest science celebration, was a year -long initiative intended to increase people’s interest in science by increasing their access to science oriented learning experiences. Being an endeavor that Meyer Tool is firmly devoted to, the company was happy to be involved. Beth remembers the daunting task list that needed to be completed for the event, in addition to her usual work. From coordinating with Science Chicago staff, to sending out invites, organizing the shop floor, and developing information and posters on the Meyer Tool provided science activities, Beth was involved in the entire process. She found that the organization of the Science Chicago event at Meyer Tool was initially a gigantic undertaking; but, looking back on it, she enjoyed her time making it happen. Organizing events and making them happen is not something that is out of the ordinary for Beth. 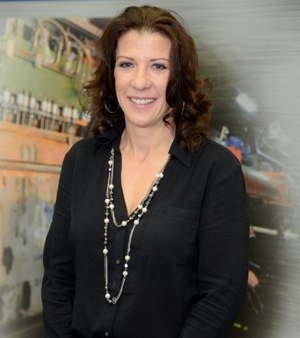 She plans the annual “Bring Your Kids to Work Day” in April, Meyer Tool’s birthday celebration every September 1, the first day of our fiscal year, the Christmas luncheon, and other happenings throughout the company. She coordinates many visits ranging from business meetings and customer calls, to visits from local politicians such as our recent engagement with Rep. Dan Lipinski. Beth worked with Rep. Lipinski’s staff and the local media when the congressman wanted to tour the Meyer Tool facility and address our employees to express his support of our manufacturing efforts. Since her first year at Meyer Tool, she, along with Ken Urban, has organized the annual Meyer Tool Picnic, building on a tradition that goes back as far as many can remember. Beth says she got “sucked into it,” smiling as she laughs about the different places, activities, and many “friendly” games that have taken place over the years. If anything has become an expectation, it is that come August, the Meyer Tool staff will be getting together to enjoy a day of burgers, water balloons, and friendly competition. Along with the now expected picnic in August, is the presence of Beth: making sure that each picnic is better than the last. What initially started as a “gut” feeling that Meyer Tool had found the “right person,” has evolved into a long term success story. With 17 years of experience, and, more importantly, with the enthusiasm and organizational skills to get anything done, Beth has become essential to the Meyer Tool team. Beth is the voice, the cheerleader, and the encyclopedia of Meyer Tool’s Operating Procedures. With employees like her, Meyer Tool knows it can continue to accomplish our goal of reducing project risk and providing the lowest total cost of ownership for our partners. Most importantly, though, we can continue to live the legacy of family values that Beth watched Meyer Tool’s founder, Frank Meyer, foster. Being a great student, Beth now fosters those values herself, through her daily actions. I believe Frank is smiling that his dream lives on.